From choosing a ceramic kitchen backsplash to restaurant tile, the design team at Limelight Tiles & Ceramics can help you step-by-step. Designing a room or an entire atmosphere for a restaurant takes a lot of time and patience to make sure all of the small details come together in the end. We want to help you select the ideal tiles and ceramics to make your design vision come to life. 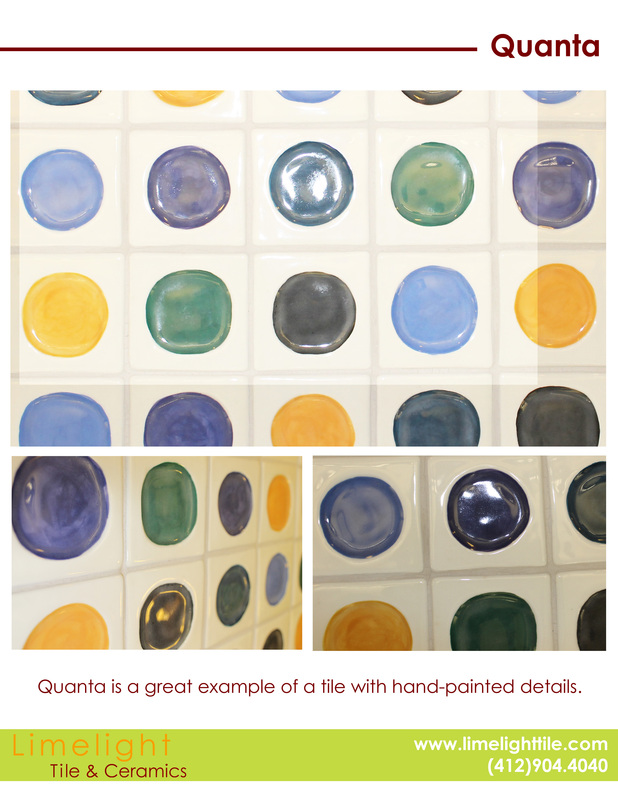 The Quanta is a remarkable design because the circles are hand-painted on each tile. If you decide to choose this pattern, you can narrow down the colors to create a repeating pattern or expand it by adding additional colors for a more significant repeating pattern. If you are interested in viewing other ceramic tile patterns, you can schedule an appointment with a designer to view our current inventory. Book a one-on-one appointment at a convenient time for you by calling (412) 904-4040 today.